On Tuesday 25th March, we had the pleasure of hosting a cupping session of the 5 Colombian microlots we have purchased this year, in conjunction with our Colombian importing partners Virmax. Alejandro and Badi were kind enough to make some time in their busy schedule to come by the roastery and conduct a Q&A session for a group of our lovely customers! El Mirador, El Cadillo, Las Brisas, Agua Regada and La Gloria. A topic of much interest and discussion was the way in which Virmax help farmers to improve standards by offering incentives. Virmax grade each coffee on a point score, and to qualify for selection, the coffee needs to score a minimum of 83 points. 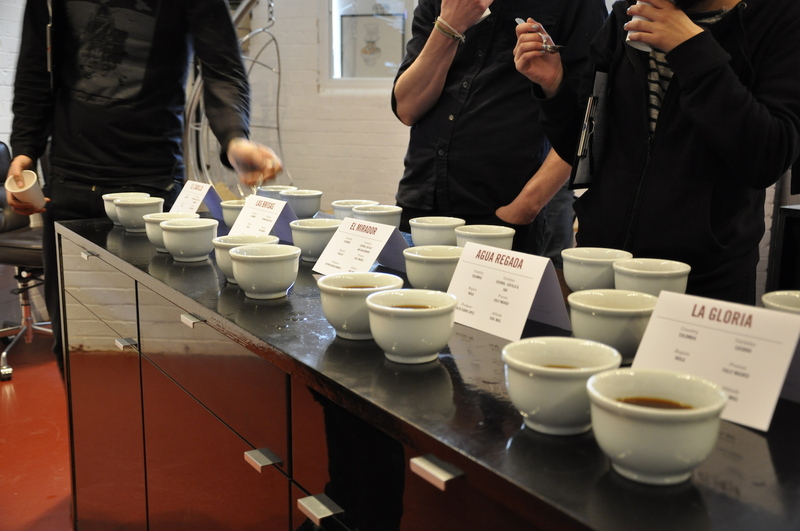 A coffee that scores 83 or 84 points are given an A grade, 85-86 are AA, and anything above 87 is given a AAA grade score, the highest possible quality. A premium is paid for coffees which reach a certain cup score, and the farmers are paid for the quality grading which they have been given. Once a coffee roaster has purchased one of the coffees, they may believe that the coffee is in fact higher than what Virmax has scored. In this instance, Virmax will then pay an additional premium to the farmer. Unfortunately over the past few years, Colombia and much of Central and South America have been badly affected with leaf rust (Roya in Spanish). Unfortunately rust is here to stay, and is not something which can be eradicated easily. Through a mix of better farm management and new coffee varietals which are not susceptible to roya, they can start to mitigate its effects, but unfortunately it is going to take time. Some varietals which are starting to show some positive results are Colombia and Catimor, but only if blended with other varietals. 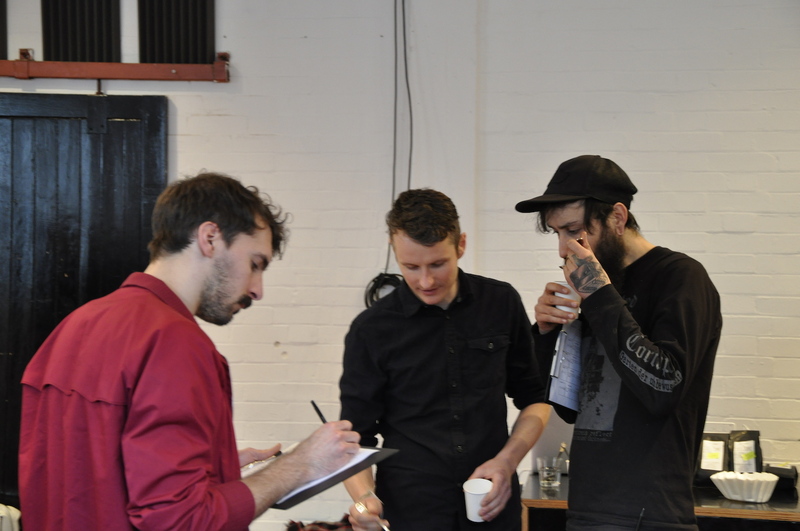 When cupping 100% Catimor, they lack the desired flavour and structure that speciality coffee buyers are searching for. How long does it take to improve quality from an 83 to an 86/87? Does it take a couple of harvests or is it quite dramatic and quick? You can see changes very quickly, depends on farmer. If they are really passionate and taking advice, within two months can be a dramatic difference in quality. Is there a training facility to help them? There is no training facility as such, but we manage a farm called San Luis where we are now in our 4th year. We have learnt a lot of things which we can put into practice on other farms. We also have an experimental farm in Popoyan, which we have 10 various varieties and they are constantly learning about processing and drying. For the normal farmers, we have PECA (Programa de Educacion Calficultores) which translates to Coffee Growers Education Program. Managed by an agronomist with many years of experience with coffee, who overseas a group of 30 producers who are either coffee growers who sell to us, or sons of producers, who have to visit 30 farms each month. They look for cleanliness of the infrastructure (cherry hopper, fermentation tanks, the dryer) and the processing techniques. We try to encourage farmers to do a dry fermentation for 24 hours, as in Colombia it is normally only 12-14 hours. We found 22-24 hours is the sweet spot, and it just so happens El Cadillo and Mirador are doing 24 hours. This is because they have been working with us for a long time and have embraced the 24hr concept. The problem with 24hrs is that the farmers run into two processes at the same time. You have to stop the fermentation process in the washed coffee, but you are also receiving the new cherry from the next day, so a lot of farmers haven’t been able to do it previously, so they need to hire more people. We also look at the drying, and we have found it makes a significant improvement in quality. We are encouraging farmers to use shade drying, or at least pre-shaded drying – which means a couple of days with no sun at all, only air flow and a very small layer of coffee on the raised drying beds, so it receives a lot of air and any moisture falls. After the first two days, they slowly introduce sun to the drying process, which in total takes 15-20 days. A lot of farmers are doing the slower drying process. The main struggle with that is cash flow, as they pick every 15 days, and if it takes 20 days to dry coffee, they won’t be able to deliver the lot to us, so they won’t have enough cash to pay the pickers next week, so we are trying to resolve these issues. The benefit of the shaded drying? We are seeing at least two points higher in grading. Coffee is a seed, and if you dry it too fast you are killing the embryo, and the embryo has all the proteins which adds the jamminess and body to a coffee. By drying too fast, you are also evaporating the water too quickly, so you lose the florals and aromatics. By establishing a slower drying process, you are protecting the seed for a longer time and you get a lot more aromatics and flavour. Which way around did the idea happen – the loss of aromatics so farmers tried shade drying, or from shade drying they found better results? It was pure coincidence. In 2007/2008, we started cupping seeds and found consistently the seeds were cupping out 3-4 points higher than their own production, and seeds are always processed under shade. We went back and asked why seeds are cupping better, and we said – ok shade! We started experimenting, and replicated results on a larger scale, so found out shaded coffee was improving cup quality. The water activity was also a lot better, generally we want activity to be 0.5, which is the equilibrium, so the longevity of the coffee was also longer. We now have farmers doing a 3 stage drying process. 1 – total shade, 2 – introduce a little bit of sun with a shaded mesh, 3 – last two to three days of full sun. By drying in this way, the parchment looks beautiful, white and fully closed, and was looking a lot better than Central American coffee at the time. Most farmers do not have a lot of room, so they created three storey dryers to take advantage of the high altitude. The farmers start with the wettest parchment at the bottom, and slowly move the coffee higher which will then be exposed to the sun at the end of the 20 days. This helps with the lack of space farmers have on their land, as they want to utilise space for trees and not for drying. Rust prevention is a major thing we work with the farmers. We have developed ways to control rust, and to use as little chemical processes as possible, farmers don’t want to spend a lot of money on chemicals. We looked back at the last 50 years to find out how rust was controlled, as it has been around since the end of the 19th century in Sri Lanka and devastated their coffee industry. Copper phosphate has been embraced for many years, and we also found something called calcium sulphate, which is all organic and is actually pretty good. These are the 3 focuses of the grower education program, and at the moment 400 farmers are now part of the program. The FNC (National Federation of Coffee in Colombia) also does an excellent job of teaching producers how to grow more coffee, as this is in their interests. The funding comes from tax from all coffee which is exported, but they don’t teach how to improve the quality of the coffee, so this is where we step in with the education program. To try and increase volume and quality as well, we need a balance. Colombia seems different to everyone else, in that they dry parchment themselves compared to most other countries in the world. Seems to be a high density of small holders who are in control the process post harvest, which is interesting. I wouldn’t go as far as saying a whole lot, as we work with 1200 farmers, and there is half a million farmers in Colombia. I would say the quality producers would be no more than about about 5000, so a very small percentage of the total, but it is slowly growing. Unfortunately, it is only the small ones which are embracing it so far, there are only a small amount of the big farms which are focusing on quality, the rest are focusing on volume. With high prices, people tend to do less work. What we are seeing when the price has gone up fast, the producers are selling their coffee in wet parchment, which means they are letting others dry the coffee for them. They receive a good price for wet coffee, and also have the benefit of receiving money the next day – it means that there is no infrastructure, no hassle and the prices are also pretty good, so it is a good proposition. When prices go down though, they are trying to look for more value. They obviously know what coffee they are buying though? When you buy wet parchment, there is no way of telling what the quality is. You don’t know what you are buying. You cannot grade it as it is full of water. It could be 70% water, this is why the traditional Colombian separation is based on bean size. Usually when they sell wet, they blend everything together to receive a good price. A lot of the time, the parchment is full of water, so the mills started to pay a very low price as they were not able to know what they were purchasing. It is so difficult to buy wet parchment, but it is a very big business. If you discount a lot, you may receive some good lots of coffee, but it is a gamble. Instead of discounting 20%, you discount 40%, so you can make a lot of money. Big parchment buyers, and some of the bigger ones own their own mill as well, who do 70,000-80,000 bags a year. They just buy from the smaller guys and blend everything together. Some producers will go to the buyers when the prices are good, but otherwise they try and do as much as possible themselves to make more money. It is a very low margin business, so the least amount of manual labour they have to do, they better. All the blending, or when the “magic happens”, is afterwards. 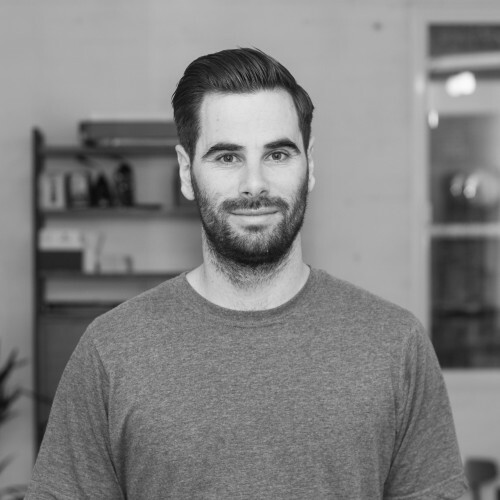 They mill the coffee, cup it, and if a coffee is great – it is classed as speciality, but if the next coffee is average they send it to the commercial buyer. This still happens today as it is easy and doesn’t cost much. This was the whole marketing of the FNC back in the 80’s, when Colombia was the world’s richest cup of coffee. You would blend all these amazing lots in with everything else, and of course it raises the average. In general, the average of Colombian coffee was better than most other countries, and it was constant. The marketing was always Cafe De Colombia, so it was singular. If you look at the marketing of other countries – Cafes de Guatemala, Cafes de Brazil, they are selling different things. The marketing in Colombia is wherever you buy, whenever you buy and from whoever you buy, it all tastes like Colombian Coffee. This is still today the marketing of Colombian coffee, something you can trust all year around. This is not what we are trying to do, we are trying to sell as much diversity as we can. If you look at statistics, we reject about 40% of what we get, and most of this is because of ferment. If our statistics are representative of the whole industry, that would mean that 20% of the coffee in Colombia is fermented. Yet everything is exported, so what do they do, they blend and blend and blend. This is the beauty of blending, and most exporters are very good at it. 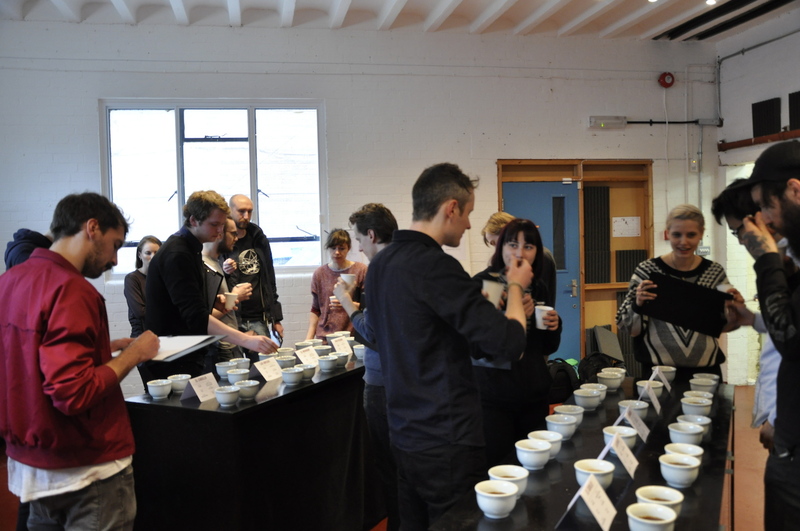 Thanks to everyone involved, and we look forward to inviting you to the roastery soon for upcoming events!